A stay at the Four Seasons Hotel Toronto feels like a city residence but with every luxury hotel amenity. At nearly every street corner in downtown Toronto, a new skyscraper seems to be sprouting out of the ground—-from balconied condominium towers, to posh office buildings, to sparkling, reflective glass-walled hotels. The Four Seasons Hotels and Resorts brand first began in Toronto in 1960, more than a half century ago. Consistent with that era, its first iteration was that of a modest motor inn. Of course, the company has grown exponentially since then to become a global portfolio of 89 luxury properties. So it’s not too surprising that the company’s founder and chairman, Isadore Sharp, would want to create a 5- star flagship property in his own hometown. In October 2012, this dream was realized with the opening of the Four Seasons Hotel Toronto in the elegant Yorkville neighborhood of the city. (This was one of three new luxury hotel openings that took place in Toronto during the same year). Located at the corner of Yorkville Avenue and Bay Street, the hotel is nestled next to an antique firehouse—with trendy galleries, designer boutiques, and world-class museums (both the Royal Ontario Museum and the Gardiner Museum) close-by, within easy walking distance. A quirky and unexpected Edwardian fountain outside the soaring building meets vehicles arriving at the circular driveway. 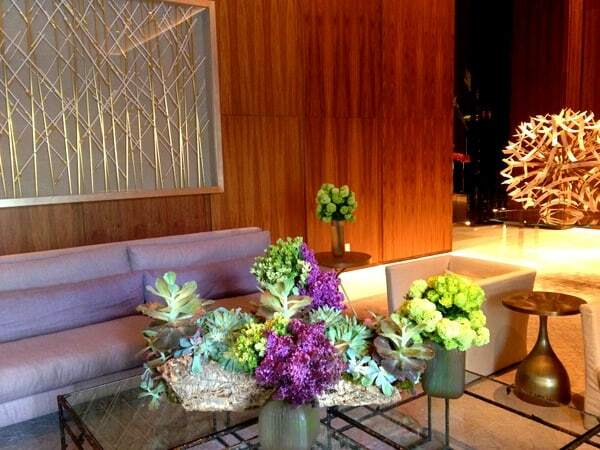 Instead of walking into a glitzy lobby, guests enter what feels more like the lobby of a private residence. Once inside, there is a comfortable seating area and in another deeper recess, a reception desk where guests are welcomed warmly by professional, multilingual international staff and made to feel at home. Above the desk is a striking dandelion sculpture, made of porcelain and wood. It’s symbolic message: Dreams come true for the guests who arrive here. In different media, that same dandelion theme is replicated on every floor. Furnished in clean, contemporary woods, Room 1903 is a deluxe one-bedroom suite washed in soothing, muted colors. Floor-to-ceiling windows allow city views as well as plenty of natural daylight into the room— even on a rainy weekend. The apartment-like corner suite has a bedroom, living room (with pullout sofa) and two bathrooms (both with showers), which make it perfect for a family of three or four, or a small group of friends. Every creature comfort has been carefully thought out to make guests feel relaxed and at home in this spacious setting. The ultra-comfortable bed that is swathed in high thread count linens; the suite has ample drawer, closet, and countertop space. Floors throughout are covered with a subtle, geometric patterned carpet inlaid into the natural wood floor. The living room has a sectional sofa, one of two flat-screen TVs in the suite, soft but adequate lighting, and a comfortable writing desk with a control panel guaranteed to please any techno-geek. It offers a complimentary Internet connection, multiple electrical outlets, and audio inputs. Although the concierge service at the hotel is flawless, do-it-yourselfers might prefer to use the free in-room iPad with a special hotel app that provides maps, local transportation options, and sightseeing ideas, as well as information about the hotel and the artists/pieces in the curated hotel art collection. The room is well insulated from both lobby and street noise. The in-room safe is at eye level so guests don’t have to bend and can easily see the contents. The minibar goes beyond bland and includes some interesting sweets from Dylan’s Candy Bar. More than ample in size, the granite walled bathroom (also with plenty of windows) feels almost spa-like. It has a separate commode with a glass privacy door, an enclosed stall shower, and a freestanding, deep soaking tub. There are other nice amenities like a TV embedded in the mirror, attractive and user-friendly faucets and fixtures, Etro toiletries, and a stack of soft-plush towels. The counter beside the sink stretches from wall-to- wall. This is one hotel that still has soap dishes beside the sink. The Four Seasons Toronto has two full-service restaurants on premises and offers 24-hour room service (with a 15-minute express menu). Although room service is an expensive indulgence, it is one that is so well executed at this property that you probably should try it at least once during your stay. Michelin-starred chef Daniel Boulud oversees the signature restaurant, Café Boulud. Open for breakfast, brunch, lunch and dinner, it couples a sophisticated menu with a relaxed, loft-like setting with contemporary pop art on the walls. Those who arrive alone can sit comfortably at a long communal table. Diners can choose from dishes in four categories: La Tradition (traditional French cuisine), La Saison (seasonal delicacies), Le Potages (vegetable garden inspired dishes) and Le voyage (international). At the street level, the even more informal D bar, known for its inventive cocktails, has twenty-foot ceilings and offers alfresco dining as well. It’s a perfect place to savor different flavors by sharing small plates with family or friends. In addition to the beautiful spa, the fully equipped, 3500-foot fitness center on the ninth floor is open 24 hours a day. There is also a relaxing sunlit pool, a whirlpool, two steam rooms, and an expansive deck with space to read or relax. Despite the rapid growth and changes taking place, Toronto is still a city of neighborhoods, each one uniquely rich in history and culture. The Toronto Four Seasons seems to fit nicely into its Yorkville setting, offering guests the feel of living in an upscale residential area of the city that is close enough to use as a launch pad for sightseeing or as a sedate mini-vacation away from the downtown traffic and bustle. The 55-floor tower has 259 hotel rooms and suites, each room with an iPad for guest use. The hotel is adjoined by a skybridge to a 26-floor tower with private residences and their own elevator and entry. The penthouse apartment atop the hotel sold for a record $36 million. The hotel has the largest spa of any Four Seasons property, with some 30,000 square feet of space. With 17 treatment rooms and a staff of 70, it is also the largest spa in the city. There are more than 1700 commissioned pieces of Canadian art (including paintings, ceramics, and sculptures) at the hotel. The lobby walls are made up of more than 50,000 pieces of polished metal. The flight time between New York City LaGuardia Airport and Toronto Pearson International is just over 60 minutes. Disclosure: As participants in the TBEX blogger conference in Toronto, we paid a media rate for our stay. Any opinions expressed in this post are our own. Wonderful pictures of a relaxing place to be pampered. What stuck out was the fact that the bathtub is so close to the countertop. Is there a lot of room to stand at the counter (next to the sink) or would you want to sit on the edge of the tub? Very different style of tub area. With its classy boutique shops and restaurants, Yorkville is a great area in Toronto for this Four Seasons hotel. Nice to have extra space with a living area too (in case one person gets up early to read the paper). Such a beautiful property! Your narrative and photos are so inviting.